The family consisted of two self-employed adults with two young busy girls heading into their teenage years. The home had to cater to international guests and long close family visits. With all the busyness that goes on in their lives, the kids had their own living level within this large home. Within this level, children have their own bedroom with private ensuite. Equal in size and setouts, just mirrored across the floor. Their bathroom was to be a space to enable them privacy and must cater for their growth into adulthood. This ensuite had to have a great amount of clever storage for all their STUFF! Brushes, sprays, bows you name it they have it. However, it had to be capable to cater for their growth into young womanhood. This it does and it does well. A small foot print, the large EAST-facing window, which makes use of the natural light in the morning. 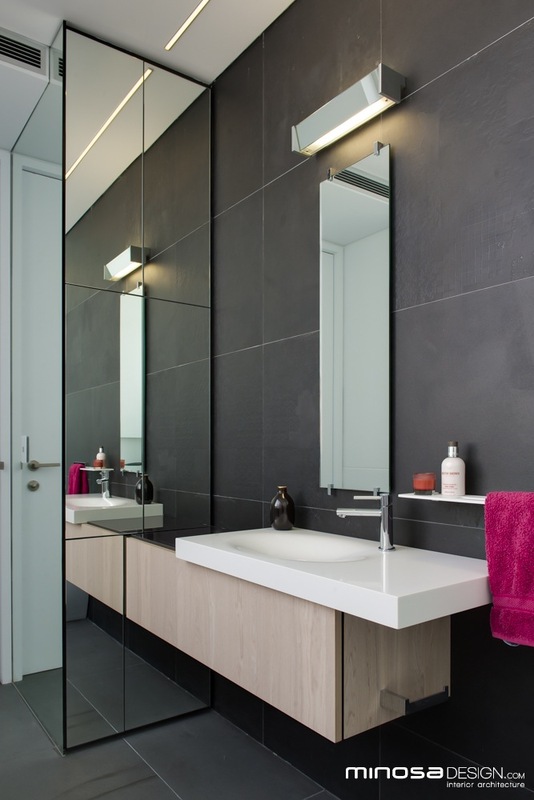 The bathroom was to be easy to maintain, effortless to clean with a good use of artificial light to assist when required. Given the fixed building constraints of the room, a large window, door location, long but narrow shape of the space, there was no other option but to place services on the only full-length wall opposite the large window. The designer choose to create a floor to ceiling cabinet on the small southern wall to create the storage and “future” make up area’s, Mirror was applied to the side to allow for a full length mirror as was the front face of the joinery. 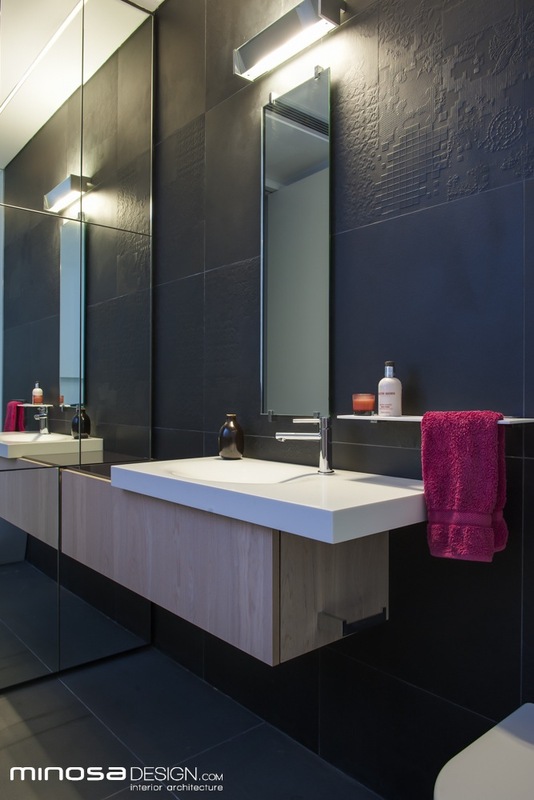 The mirror assists in making the space feel larger but it also bounces the natural light around allowing the selected dark Basalt floor tiles (throughout the whole home) to be successful within the space. To complement the basalt floor tiles the designer chose a 600x600mm Mutina Dechirer wall tile in flat and embossed patterns. Designed by Patricia Urquiola for ceramic house Mutina Italy they create a custom textured tile layout to fit the decorative side of the brief. 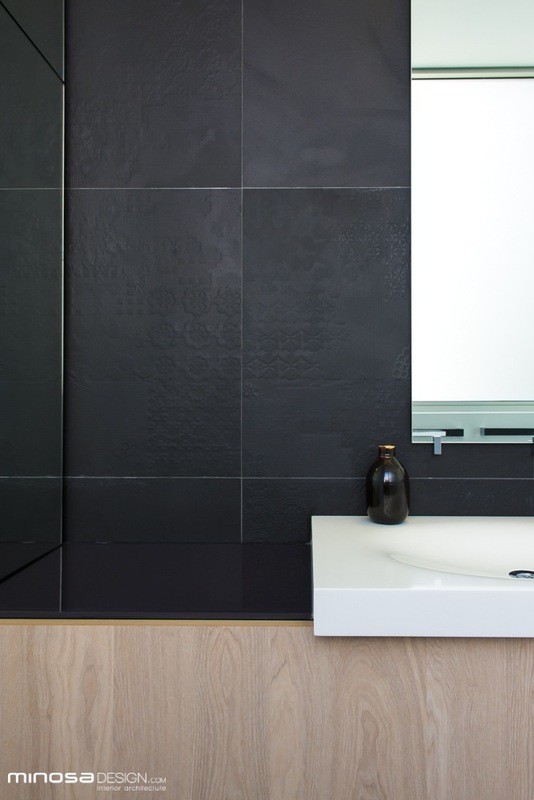 Corian® was chosen for the shower recess for its seamlessness and ease of cleaning. This also (being white) helped to lift the space and refract light. It created a great focal point to the end of the room drawing your eye thru. 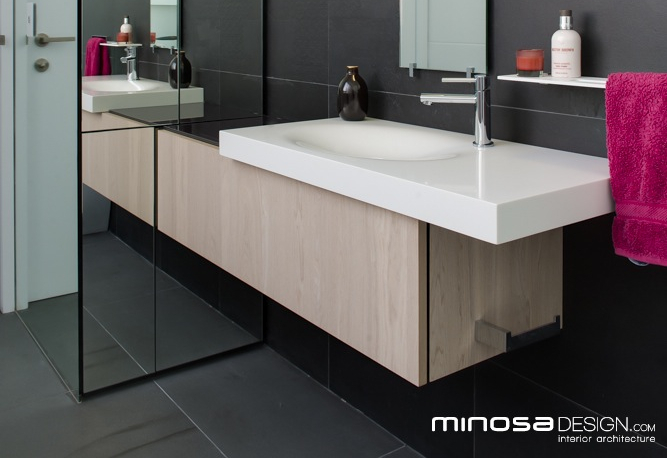 This also offered a sense of balance with the vanity area as it is also made with Corian®. 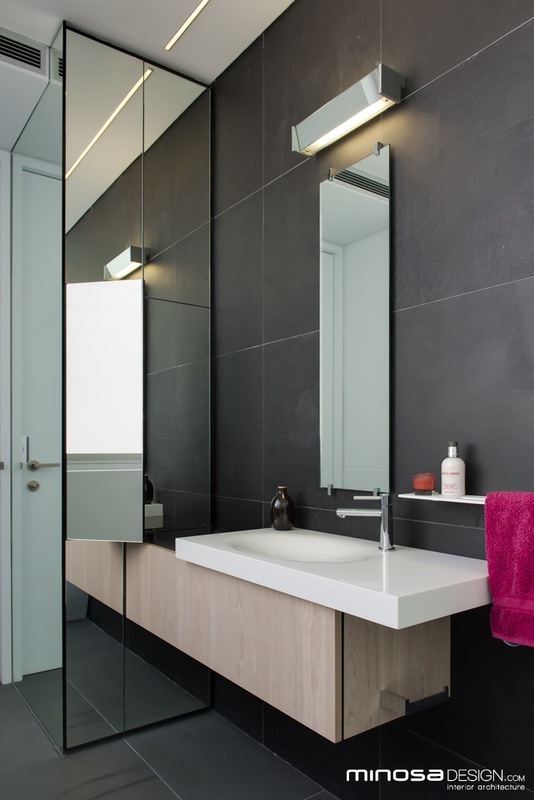 The Corian® washbasin was selected as it is Australian made and effortless to live with and maintain as the young girl matures. The custom deep base drawer unit of the vanity is electronically operable with Blum servo drive mechanisms and houses all of the toiletries and cleaning product. The basin is offset to add a little bench space to the left from a practical perspective and from aesthetic approach it plays on the cantilevers of the architecture. The shower screen was made floor to ceiling, which increases the height and scale of the space. There are NO halogen lights in the ceiling! 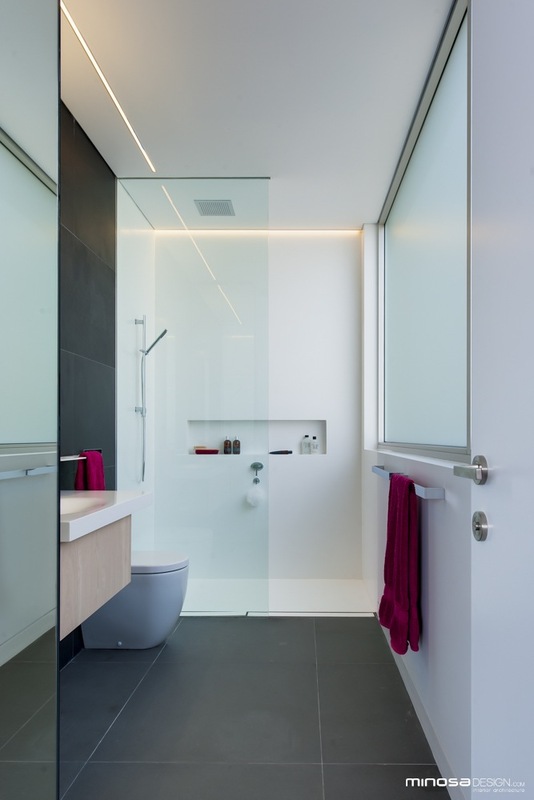 Two LED extrusions with diffusers are sufficient to illuminate the space; one placed as a wall wash down the Corian® shower wall & the other over the toilet and the vanity area. A task light is placed over the mirror to give even facial illumination. 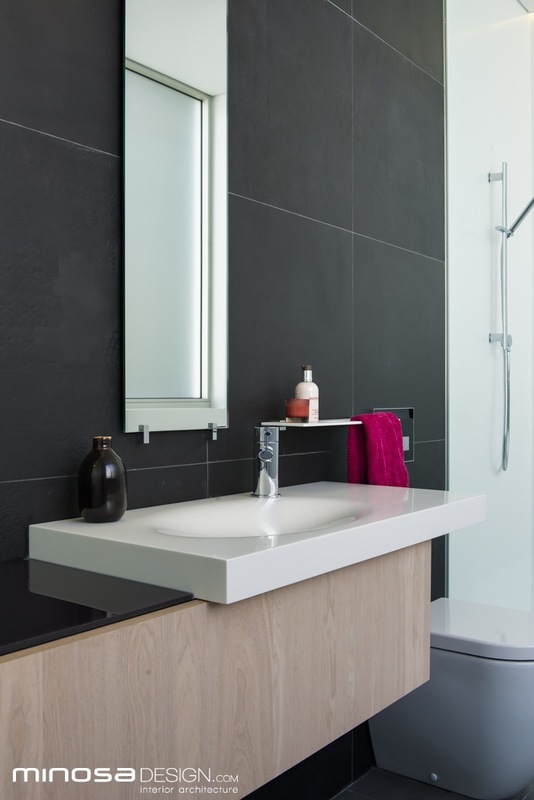 Accessories and tapware fittings are from Gessi. Chosen for their durability and high quality construction the client having lived with them in a previous home was well aware of their credentials. Overall, the success of this space lies in the integration of all amenities into the one wall and the way the light and scale of the space is utilised by the designer. It will definitely cater to the growing needs of the young girl for many moons to come.